Welcome to our wedding website! We've done our best to assemble everything you need to plan your visit to Snohomish. From how to get there, to where to stay, places to visit, and our favorite local spots, we've got you covered. Welcome to Snohomish! Join us from 8-10pm at Center Public House for welcome drinks and snacks. We can't wait to see you! Kirsten and Jon gather their favorite people together in one place, say their vows, and celebrate! The ceremony will start at 4pm so please plan to arrive 15 minutes early. Reception to follow! The wedding is over but that doesn't mean the fun has to stop! 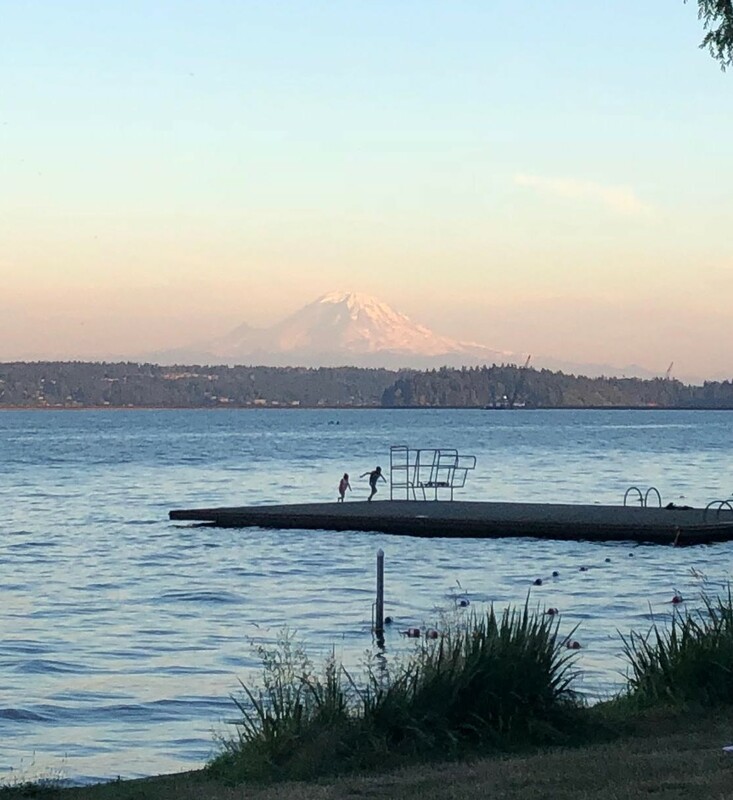 Come drop by our favorite Seattle picnic spot/swimming hole on the shores of Lake Washington. Enjoy stunning views of Mt. Rainier, take a chilly dip in the lake, and munch on grilled burgers, hot dogs, and other snacks. We'll be hanging out there from 1pm to 5pm and we'd love to see you. Getting to Snohomish from Sea-Tac. If you're flying in from out-of-state, chances are good you'll arrive at Seattle-Tacoma International Airport, which is 45 minutes to an hour from Snohomish, depending on traffic. Take the shuttle. Shuttle Express offers shared ride and private van service to and from the Snohomish area and Sea-Tac. You should book in advance online or through their app. The company recommends allowing for extra time for pick-ups and drop-offs, so total travel time may vary. Drive. 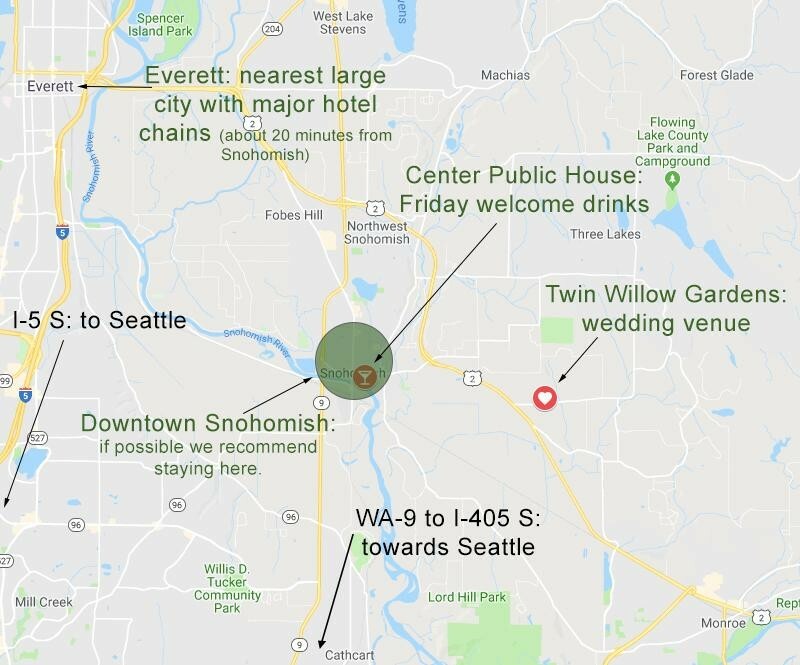 If you rent a car, you can drive directly to Snohomish from Sea-Tac. You have two main route options, one of which may be faster than the other, depending on traffic conditions. Seattle traffic can get pretty bad at certain times of the day, so we highly suggest consulting Google or Waze before setting out. Via the 405. This route is usually the fastest option, taking you east from Sea-Tac before heading north along the east shore of Lake Washington. From the airport, take WA-518 East to 405 North. Stay on that for about 27 miles. NOTE: Unless you have a "Good to go!" Toll pass, avoid the express toll lanes on the left, which might incur additional fees for your rental. Take exit 23 for Wa-522 East. After 3.7 miles, follow the signs for WA-9 North, which will take you into town. Via I-5. Although this is a slightly longer option, if traffic is unusually heavy on the 405 this route may be faster. It takes you directly through downtown Seattle before heading east towards the Cascade Mountains. From the airport, take WA-518 East to I-5 North. Stay on that for about 45 miles. Take exit 194 towards US-2 East. In about 3 miles take the exit towards WA-9 South and continue into Snohomish. Getting to Snohomish from Seattle. Drive. From downtown Seattle, take I-5 South to I-90 East. Stay on I-90 East for about 5.5 miles, across the floating bridge on Lake Washington. Take exit 10A to I-405 North. Stay on 405 North for 12 miles. Take exit 23 to WA-522 East, go 3.7 miles. Take the WA-9 North exit towards Snohomish. In about 10 miles you’ll enter Snohomish. NOTE: If you have a rental car we recommend you do not take the state road 520 floating bridge across Lake Washington, because it is a toll bridge and you may incur additional fees on your rental without a “Good to go!” toll pass. I-90 East (our recommended route) also crosses Lake Washington via floating bridge and does not charge a toll. Public Transit. The 424 bus offers weekday-only service to and from Snohomish from downtown Seattle. While this is definitely the most affordable way to get to Snohomish (just $4.25 one-way), you should be aware that this trip can take up to two hours and possibly longer, making many stops in towns along the way. Although we love Snohomish for its historic downtown and gorgeous natural setting, there are somewhat limited options when it comes to places to stay in the town itself, so we encourage you to book your accommodations as far in advance as possible. 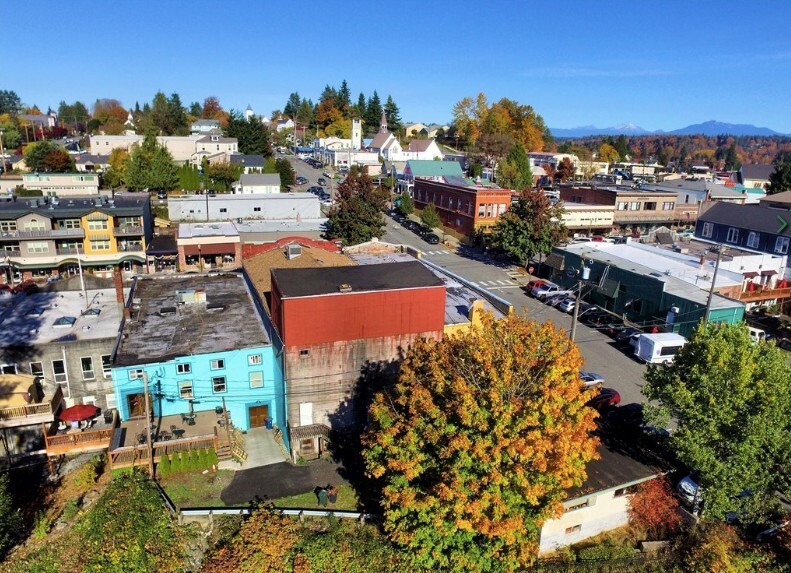 We recommend staying in or near downtown Snohomish—that's where we're staying! We will be providing a shuttle from downtown to our wedding venue (Twin Willow Gardens) and back, about a 5-minute drive. The Friday welcome drinks will take place at Center Public House, also located downtown. Private rooms in downtown Snohomish. Whole homes in downtown Snohomish. Private rooms beyond downtown Snohomish. Whole homes beyond downtown Snohomish. Please keep in mind these are not exhaustive lists (just our favorites) so feel free to do your own research too. If you’re unfamiliar with Airbnb, we recommend checking out these helpful tutorials on how to set up an Airbnb account and how to book an Airbnb. Airbnb’s website also has a helpful guide. 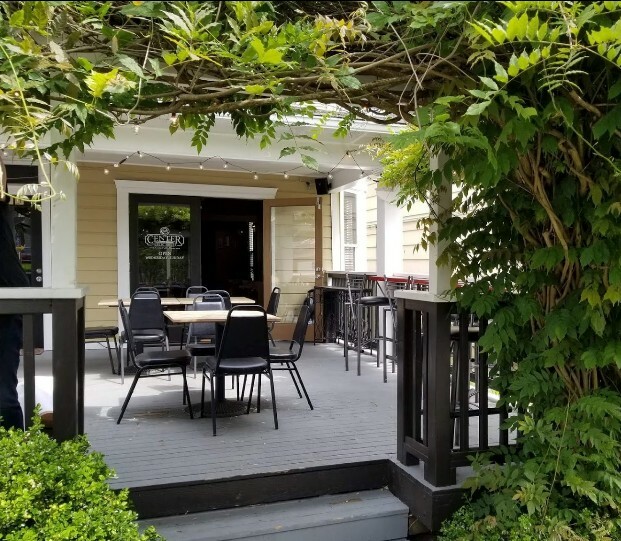 With 21 rooms, The Snohomish Inn offers comfy rooms for sensible prices, and it's an easy walking distance from all that downtown Snohomish has to offer. This cute B&B has just three rooms on offer, so if you’re interested you should book here as soon as possible. Homeaway is another vacation rental website similar to Airbnb, where additional accommodations may be available. About 20 minutes away, Everett is the closest “real” city in Snohomish’s vicinity. There you’ll find many familiar national hotel chains. Washington State has an incredible amount to offer. We're so excited to share it with you, and we want to make sure you can best take advantage of your time out here during our wedding weekend. That's why we've put together an interactive Google Map featuring hikes with a range of difficulties, as well as some of our favorite nearby area sights. Wedding events are also included, so you can keep your bearings. 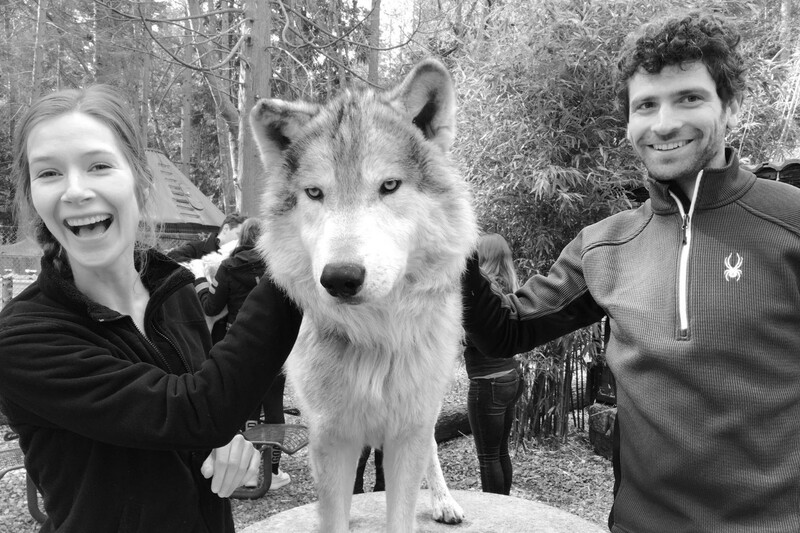 We hope you find our wedding guide useful! Meadowbrook Beach Park (Easy). 30 minutes' drive from Snohomish. This is a short hike through a forest to a coastal beach, with views of the Puget sound and Olympic mountains in the distance on a clear day. It is 2.5 miles roundtrip with 425 feet of elevation gain in total. There is no parking pass or entry fee required, but note that the parking lot only holds 30 cars so you may need to find street parking. You can view more information here. Lake Twenty-Two (Moderate). Does the photo above look familiar? It should—that's Lake Twenty-Two, which featured prominently on the save-the-date postcard you received. 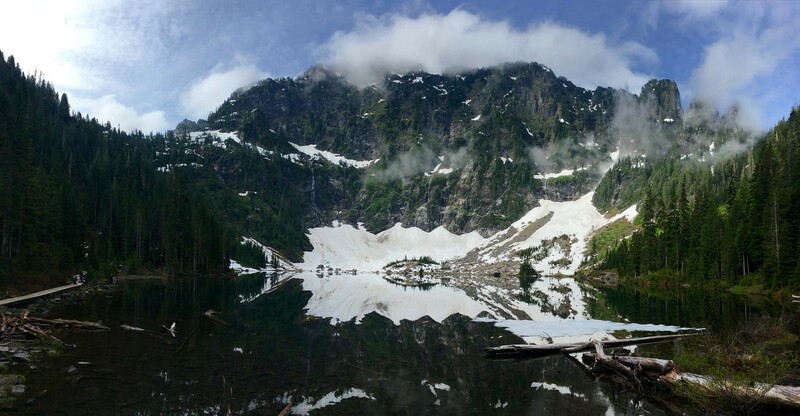 About 45 minutes' drive from Snohomish, this trail climbs up through old growth forest to a stunning alpine lake. The trail can be wet and rocky, but as far as day hikes in Washington go it is not overly strenuous. It is 5.4 miles roundtrip with 1350 feet of elevation gain. This is a very popular trail so we recommend arriving at the trailhead as early as possible (before 8am) to snag one of the parking spots in the relatively small parking lot. Any later and you may have to wait for a spot or try another trail. You can view more information here. Lake Serene (Strenuous). 40 minutes' drive from Snohomish. This gorgeous trail leads up to the tranquil turquoise waters of Lake Serene, with the stunning tooth-like cliffs of Mt. Index rising across the lake. This hike is a bit more strenuous than Lake Twenty-Two: it's longer (8.2 miles round trip), steeper, and has a greater elevation gain (2000 feet), but it features a larger parking lot and so you may not need to get to the trailhead quite as early to snag a spot. You can view more information here. Note: For any hike you do in Washington, we always recommend sturdy hiking shoes and plenty of water and snacks. Hiking poles may he helpful in slippery areas. If you're not comfortable with a trail, turn around and head back down. For Lake Twenty-Two and Lake Serene you will need a printable parking pass ($5) to hang in your car, which you can purchase here. Your presence at our wedding is the best gift we could hope to receive from you and gifts are not required or expected. But if you'd still like to get us something extra, we went ahead and made a registry for that on Zola. If you have the time to take off an extra few days or a week there are many places we love in Washington that we think you'd love too. Here's just an overview of some of our favorite spots to explore. We'll be happy to give you more detailed recommendations—just ask! Seattle. Check out our interactive map for an insider's guide to our favorite stuff to see, do, eat, and drink in beautiful Seattle, Washington. Go up the Space Needle for expansive views of the city and mountains, visit Pike Place Market, hike down to the coast through Discovery Park. 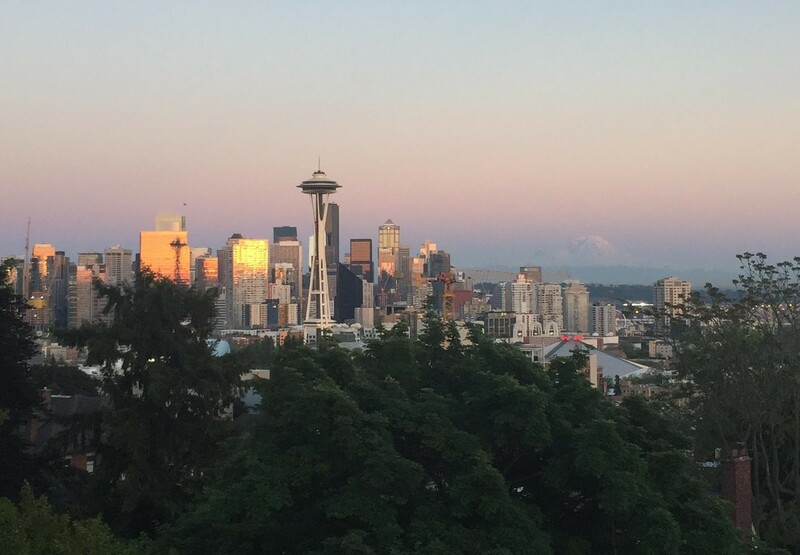 For more iconic views of the city check out Kerry Park in Queen Anne (featured in the photo above) and Gasworks Park in Frement. On a rainy day visit the Seattle Art Museum or the Museum of Flight. On a sunnier day rent a kayak and explore downtown from Lake Union or rent a canoe from the university and paddle into the Arboretum. Wander through our favorite neighborhoods Capitol Hill, Fremont, and Ballard, and sip on local brews at our favorite hangout Chucks in Central District. Be sure to check out our Seattle guide for all of our favorite local spots. Whidbey Island. Take the short ferry from Mukilteo to Clinton on Whidbey Island. Visit the quaint town of Langley with antique shops, a glass blowing studio, and views of the sound. Stop in at Whidbey Island Pies before continuing on to enjoy beautiful views from the rocky beach at Ebey's Landing. Return to Mukilteo by the ferry, or continue northward to Deception Pass and cross the bridge on foot for views of Mount Baker and British Colombia on a clear day. The island is fairly small so this could be done as a day trip. Chelan. Stay in the city of Chelan and enjoy delicious wine and Italian food. Take the Lady of the Lake ferry up Lake Chelan to the small town of Stehekin; with no road access this town has been relatively isolated since its founding. Explore the town on foot or by bicycle, and make sure to check out the bakery in the morning for their famous cinnamon rolls. For the more adventurous: have the ferry drop you at Prince Creek and backpack into town on the Chelan Lakeshore Trail. San Juan Islands. Take the ferry from Anacortes to either Lopez or Orcas Island and look out for dolphins and orcas along the way. Stay at a B&B and soak up the relaxed island culture, eat yummy local food, ride your bike around the island, go wine tasting, and go on relatively easy coastal or mountain hikes. Olympic National Park. Stay at Lake Crescent Lodge and enjoy the beautiful views of the lake, wander through old growth forest on the Hoh River Trail, and drive to Hurricane Ridge for stunning mountain views with zero hiking required. The Olympic Coast. This is probably our favorite place in the state. 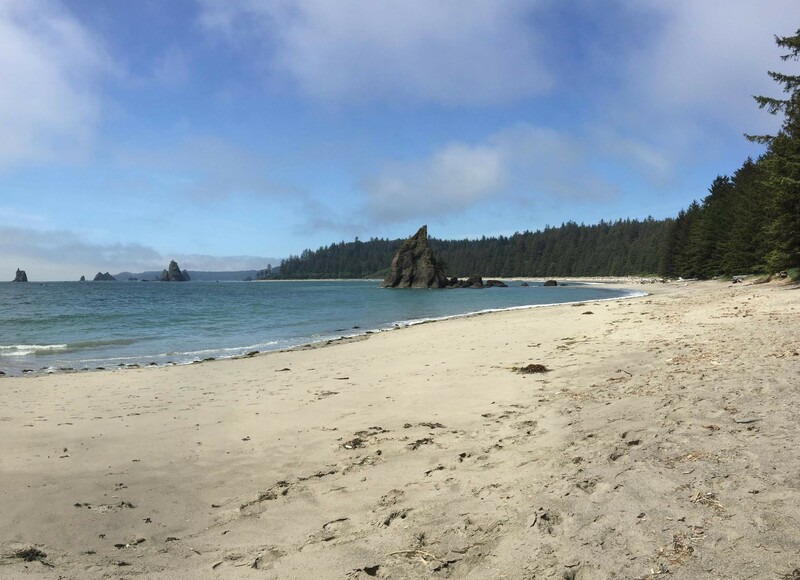 Hike a mile down to the coast at Third Beach, and spend the day on the beach or hike up to seven miles further down to Toleak Point (featured in the photo above) for non-stop breathtaking views of wild beaches and sea stacks. You can camp anywhere along the coast here, with ample driftwood for making cozy campfires. Alternatively, drive to the northwesternmost point of continental USA and hike a short 0.75 miles to Cape Flattery. The North Cascades. Swim near the learning center in the turquoise, chilly waters of Diablo Lake, stop by the resort to rent a motor boat and explore the islands of Ross Lake, and stay in western-themed Winthrop with access to many stunning hikes (note that many North Cascades hikes will still be snow-covered in late June so make sure to check trip reports before planning on this spot). The South Cascades. Visit the Mount St. Helens forest learning center located within the blast zone and see the wild landscape that has been left untouched since she blew in 1980, learn more about the eruption in the museum, hike along Coldwater Lake to see remnants of logging machinery that were partially buried during the eruption, and check out the ape caves. Mount Rainier National Park. Hike through old growth forest and enjoy views of Mount Rainier on Rampart Ridge Trail only 1.5 hours from Seattle. Drive a bit further to Paradise on the lower slopes of Rainier and experience breathtaking views from the parking lot and hike through alpine meadows on Lakes Loop Trail and the Skyline Ridge Trail. If you're in the mood for a more strenuous climb, hike our favorite trail in the park to Summerland and Panhandle Gap (note that there will still be some snow in Rainier National Park in June so make sure to check trail reports for conditions before heading out).